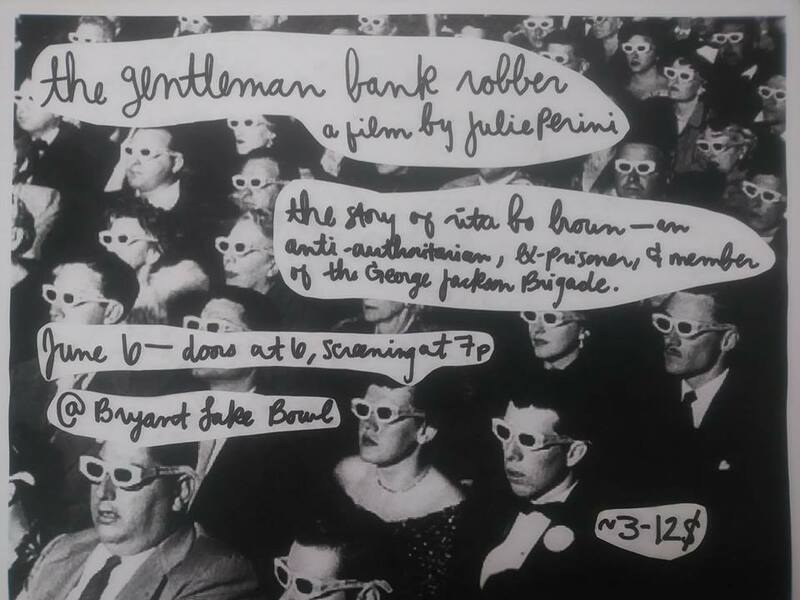 A film screening of The Gentleman Bank Robber, a film by Julie Perini, and a panel discussion to follow (panelists TBA). The Gentleman Bank Robber is a portrait of revolutionary rita bo brown, a white working class butch from rural Oregon who became known as “The Gentleman Bank Robber” for combining her butch style of dress with a polite way of demanding funds from bank tellers. The film moves between everyday moments with bo in and around her current home in Oakland, California, and historical retelling of the events of bo’s extraordinary life through interviews with bo and her collaborators, archival materials, and rare social movement ephemera. The Gentleman Bank Robber weaves together personal and political perspectives on 20th century social movement histories, including queer liberation in the 1960s; militant, underground activity with the George Jackson Brigade in the 1970s, a revolutionary prison abolitionist group; political prisoner support work in the 1980s, and prison activist work into the present day. bo brown is a model for how to lead a life of committed activism while maintaining a sense of humor and humanity. Doors at 6pm. Film at 7 sharp. Sliding scale admission 3-12 dollars, costs split between the venue and bo brown’s health care.